Amazon today announced the launch of AWS Greengrass, a new service that will be built into IoT devices to bring them better and smarter compute capabilities. 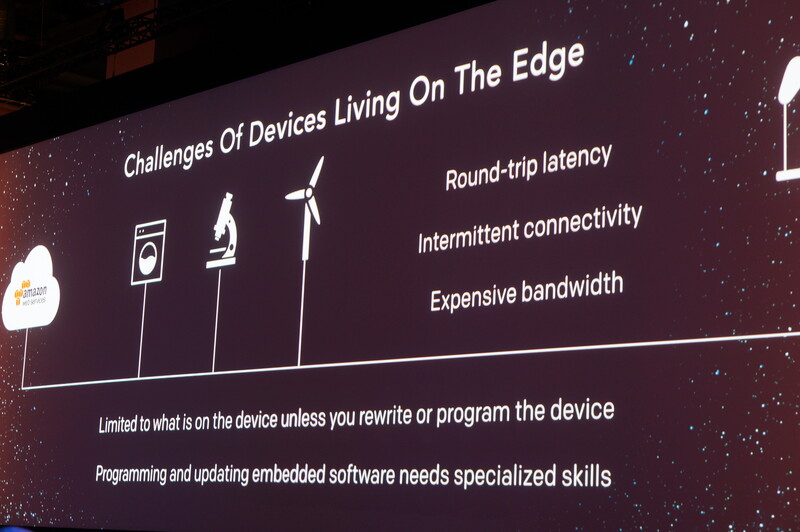 As AWS CEO Andy Jassy noted in today’s keynote at Amazon’s re:Invent developer conference, Amazon expects that the majority of on-premises hardware will soon be IoT devices as enterprises move their servers into the cloud. Typically, though, these IoT devices have always been relatively low-powered, both in terms of CPU and local storage. That’s why these devices are so reliant on the cloud, of course. Still, occasionally you may want to do the computing right on the device or when the connectivity is down. Greengrass builds on top of AWS IoT and AWS Lambda, Amazon’s “serverless” compute service. It will allow developers to write Lambda code (in Python) that can run right on the IoT device. The Greengrass Core runs these Lambda functions locally, but can also talk to the AWS cloud and allows IT admins to manage these devices and the code that runs on them. To do all of this, Amazon needs partners, of course, especially given that it doesn’t build its own enterprise IoT devices. These include Intel and Qualcomm, as well as Canonical and Amazon’s own Annapurna Labs. Devices need to offer at least 128 MB of memory and an x86 or ARM CPU that runs at 1 GHz or more. The service is now in preview (though it’s unclear where you would get compatible devices right now). Once it is generally available, you’ll be able to use up to three devices for one year for free. After that, the cost per Greengrass core is $0.16 per month/device for up to 10,000 devices.